Uplighting is the most commonly used garden lighting technique, for shrub borders and trees especially. By uplighting trees, one exploits a unique opportunity to add vertical emphasis and drama. Trees with an open habit allow light to fully display the branch structure, while the contrast of colour between subjects can be emphasised. The light coloured bark of a silver birch, the coppery stems of Prunus serrula, the golden fern-like foliage of Gleditsia triacanthos "Sunburst" or the translucent fiery leaves of Acer palmatum "Crimson King" are examples of good lighting subjects. For trees with dense canopies and darker foliage, uplighting rarely works well on its own. Uplighting through the central branch structure and crosslighting the canopy from a second source is one alternative; really dense canopies, such as conifers, can only be lit from outside. Where there are several trees in a view, avoid lighting them uniformly (unless you are lighting an avenue). Light some from the front and others from the side to provide contrast. Lighting a house wall to silhouette a tree in front is an interesting effect if the tree has an open structure. Alternatively a spotlight in front can project the shadow of a tree onto the wall behind, a good way of using a small acer to create a big effect in a newly planted garden. Trees can be good lighting platforms in relation to shrub borders, as well as a way of lighting terraces, driveways, paths, steps and seating areas. A favourite technique is "moonlighting" down from low power lights fixed in a tree to shadow the lower branches and foliage onto the ground below. This provides a wonderfully subtle, dappled lighting effect over a tree seat and is also a creative way of integrating the lawn into the lighting scene or lighting a path or drive in a rural garden. For moonlighting, or if you are spotlighting a feature from a tree or uplighting a tree canopy above a tree seat, use Elipta Compact tree mount spotlights to mount a tree spotlight with rustic brown powder-coat finish which blends well with tree bark. You may like to experiment with a pale blue "moonlighting" filter to provide the cool light of the moon instead of the more golden light of an unfiltered halogen lamp. The strap-on tree mount comes with a choice of 5 lengths of mounting strap as the kindest way to fix small lights to a tree without screws. Hanging lights can also be used in smaller trees to provide pools of light and decorative sparkle over a patio area. Low wattage 20w - 35w lamps with wide beam angles are generally best for moonlighting unless you need brighter lighting for a particular reason. The Elipta COMPACT spike spotlight is one of the best low voltage spike spotlights for uplighting smaller trees and comes in a variety of materials and finishes including rustic brown finish which blends into woody settings. 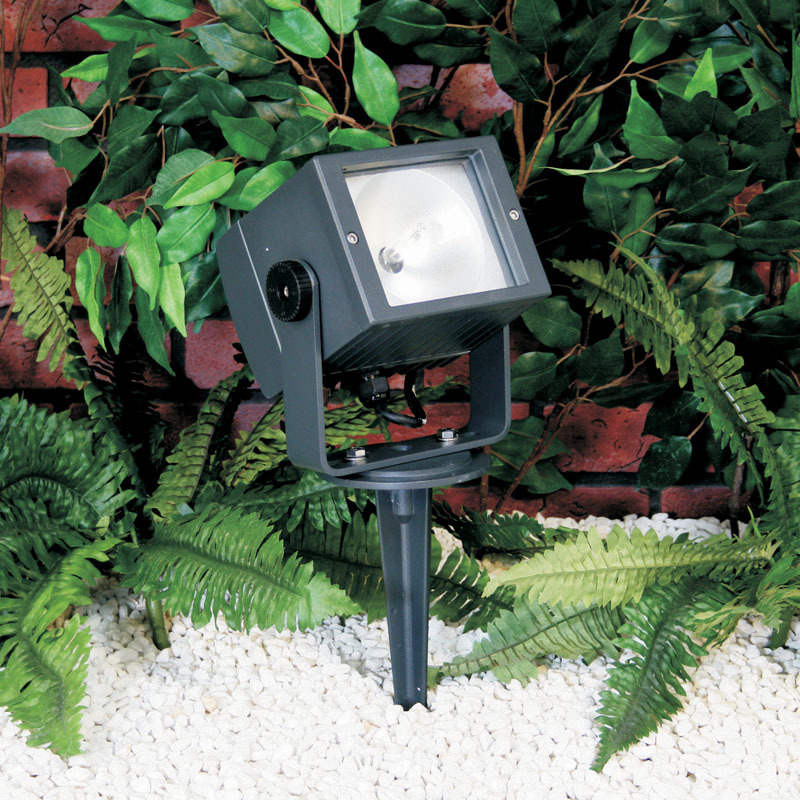 Designed for 50w halogen lamps, the Elipta COMPACT spike spotlights now also accommodate the new generation of POWERSAVER energy-saving halogen lamps, which provide 50% more light than a conventional halogen reflector lamp for the same power consumption – so a COMPACT spotlight with a POWERSAVER 50w lamp now does the same job as a larger 75w halogen spotlight used to do. 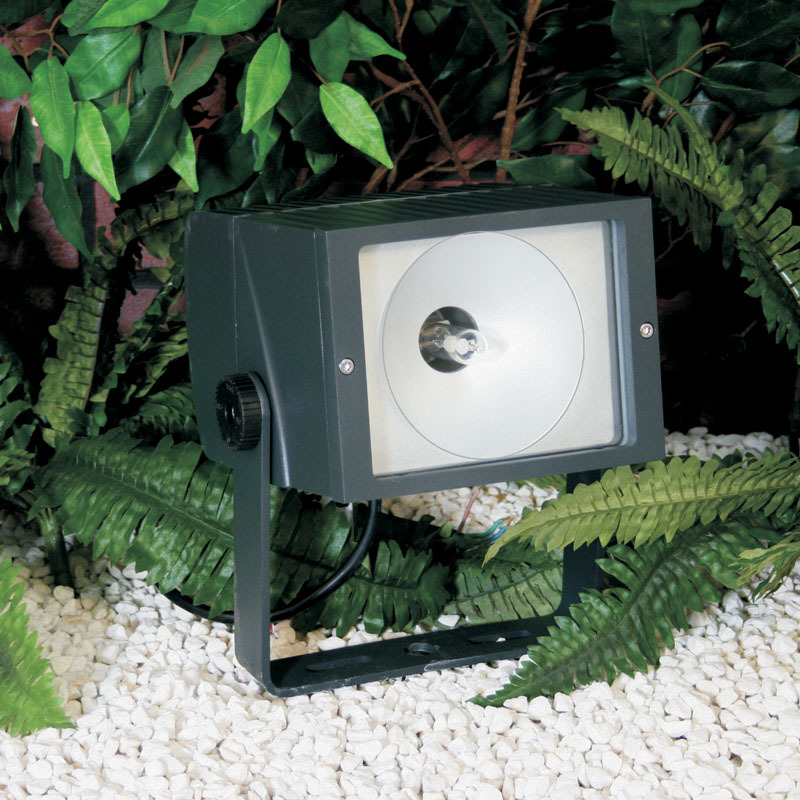 A general purpose low voltage or mains voltage recessed uplight, the MODULA range, also features a 50w model which accepts POWERSAVER lamps for uplighting small trees - remember to use cooler led lamps in walkover areas as the lenses can get very hot with these halogen lamp wattages. Try to "fit" the lamp beam to the tree shape to avoid wastage of light and energy by studying the lamp beam diameter and the pool of light it provides at a given distance. To uplight small to medium size trees, use one or more tungsten halogen or POWERSAVER lamps of 50 watts and a beam angle to suit the tree - 24 degrees for a slender silver birch, 60 degrees for a weeping tree and 36 degrees for most tree shapes in between. Help and Tips provides useful helpsheets on subjects such as choosing the right lamps for your spotlights and uplighting trees. Uplighting for larger trees generally means moving to mains voltage uplights using metal halide light sources. These are high-efficiency white light sources with controlled beams for effective uplighting while avoiding excessive light pollution if used properly.